work-related learning, alternanza scuola-lavoro, orientamento formativo, soft skills, ricerca qualitativa. L’articolo presenta una ricerca-azione realizzata con gli studenti di quattro Istituti della Secondaria di II grado della provincia di Arezzo, coinvolti in attività educative di tipo laboratoriale finalizzate allo sviluppo delle Career Management Skills. 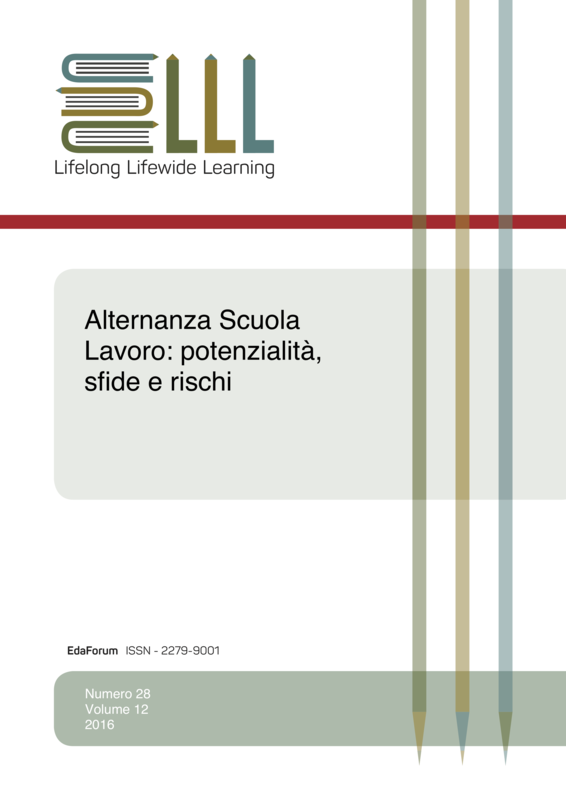 La ricerca si inserisce nell’ambito degli studi del work- related learning e propone un modello di intervento educativo in grado di accompagnare la progettazione dell’alternanza scuola lavoro con il coinvolgimento diretto dello studente, sviluppare percorsi di orientamento formativo, rafforzare le soft skills in una prospettiva di employability. This paper presents an action-research realized with students of four Secondary Education Institutes in the Province of Arezzo, involved in a laboratory to develop Career Management Skills. The research is part of work-related learning studies and offers an educational intervention model able to facilitate the design of school-work alternance with the direct involvement of the students, to develop guidance paths, to strengthen soft skills in an employability perspective. AA. VV., Il Mercato dei Beni Culturali e la Nuove Generazioni, CD&V, Firenze, 2013. Bortolotti A., Calidoni M., Mascheroni S., Mattozzi I., Per l’educazione al patrimonio culturale. 22 Tesi, Milano FrancoAngeli, 2008. Barrows H., Tamblyn R., Problem-based learning: an approach to medical education, in “Medical Education”, Volume 1. New York: Springer Publishing Company, 1980. Barrows HS., The Tutorial Process, Springfield, IL: Southern Illinois University School of Medicine, 1988. Binetti P., Alloni R., Modi e modelli del tutorato. La formazione come alleanza, Ma. Gi., Roma, 2004. Bradbury H. (a cura di), The SAGE Handbook of Action Research. Participative Inquiry and Practice, Sage, London, 2015. Brandon A.F., All A. C., Constructivism theory analysis and application to curricula, in “Nursing Education Perspectives”, 31- 2, 2010, pp. 89-92. Brown J. S., Collins A., Duguid P., Situated cognition and the culture of learning. Educational researcher, 18(1), 1989, pp. 32-42. CEDEFOP, The Skill Matching Challenge: Analysing Skill Mismatch and Policy Implications, Publications Office of the European Union, Luxembourg, 2010. CEDEFOP, Lifelong guidance across Europe: Reviewing policy progress and future prospects, 2011, http://www.cedefop.europa.eu/en/publications-and-resources/publications/6111 (30.10.2016). CEDEFOP, Skills, Qualifications and Jobs: the making of a perfect match?, 2015, http://www.cedefop.europa.eu/en/publications-and-resources/publications/3072, (30.10.2016). CEDEFOP, Focus on Skills Challenges in Europe, 2016 http://euskillspanorama.cedefop.europa.eu/sites/default/files/2016_Skills_Challenges_AH.pdf (30.10.2016). Coggi C., Ricchiardi P., Progettare la ricerca empirica in educazione. Roma: Carocci, 2005, pp. 26-27. Coll R., Eames C., Paku L., Lay M., Ayling D., Hodges D., Ram S., Bhat R., Fleming J., Ferkins L., Wiersma C., Martin A. J., An exploration of the pedagogies employed to integrate knowledge in work-integrated learning in New Zealand higher education institutions, Wellington, New Zealand: Ministry of Education, 2008. Commissione Europea, Europa 2020. Per una crescita intelligente, sostenibile, inclusiva, Bruxelles, 3.3.201, [COM (2010) 2020]). Commissione Europea, Istruzione e Formazione 2020, (2009/C119/02). Consiglio d’Europa, Resolution on better integrating lifelong guidance into lifelong learning strategies, in: Official Journal of the European Union, C 319, 13.12.2008, http://eur-lex.europa.eu/legal-content/EN/TXT/?uri=celex%3A42008X1213(02), (30.10.2016). Denzin N. K., Lincoln Y. S., Handbook of qualitative research, Sage, Thousand Oaks (California), 2005. Dewey J., Il mio credo pedagogico, La Nuova Italia, Firenze,1959. Dewey J., Esperienza e educazione, La Nuova Italia, Firenze, 1973. Dirkx J.M., Work-related learning in the United States: Past practices, paradigm shifts and policies of partnerships, in M. Malloch, L. Cairns,K. Evans, B N. O’Conner (a cura di), The international handbook of workplace learning: Theory, research, practice and issues. Sage, London, 2011, pp. 293-306. European Central Bank, Comparisons and contrasts of the impact of the crisis on euro area labour markets, Occasional Paper Series, N. 159, 2015, https://www.ecb.europa.eu/pub/pdf/scpops/ecbop159.en.pdf, (30.10.2016). European Commission, Employment and Social Developments in Europe 2012, http://ec.europa.eu/social/main.jsp?catId=738〈Id=en&pubId=7315 (30.10.2016). European Lifelong Guidance Policy Network, Designing and Implementing Policies Related to Career Management Skills (CMS), 2015, http://www.elgpn.eu/publications/browse-by-language/english/ELGPN_CMS_tool_no_4_web.pdf, (30.10.2016). European Lifelong Guidance Policy Network, Lifelong Guidance Policies: Work in Progress. A report on the work of the European Lifelong Guidance Policy Network 2008–10, 2010, http://www.elgpn.eu/publications/browse-by-language/english/EN_ELGPN%20Short%20Report%202009_2010.pdf/ (30.10.2016). European Parliament and Council, Recommendation on key competences for lifelong learning, 30.12.2006, 2006/962/EC http://eur-lex.europa.eu/legal-content/EN/TXT/?uri=uriserv:c11090 (30.10.2016). Fedeli M., Grion V., Frison D. (a cura di), Coinvolgere per apprendere. Metodi e tecniche partecipative per la formazione, Pensa Multimedia, Lecce, 2016. Fox R., Constructivism Examined, in “Oxford Review of Education”, Vol. 27(1), 2001. Freudenberg B., Brimble M., Cameron, C., WIL and generic skill development: The development of business students' generic skills through work-integrated learning, in “Asia-Pacific Journal of cooperative education”, 12(2), 2011, pp. 79-93. Gardner P., Bartkus K. R, What’s in a name? A reference guide to work education experiences. Asia Pacific Journal of Cooperative Education, 15(1) 2014, pp. 37-54. Institute for the Future for University of Phoenix Research Institute, Future Work skill 2020, Palo Alto, 2010. ISFOL, PIAAC-OCSE. Rapporto nazionale sulle Competenze degli Adulti, 2014, http://www.isfol.it/piaac/Rapporto_Nazionale_Piaac_2014.pdf (30.10.2016). Krajcik J. S., Blumenfeld P.C., Project-Based Learning, in R. Keith Sawyer (a cura di), The Cambridge Handbook of the Learning Sciences, Cambridge University Press, 2006. Lave J., Cognition in Practice: Mind, mathematics, and culture in everyday life, Cambridge University Press, Cambridge, 1988. Lave J., Wenger E., Situated Learning: Legitimate Periperal Participation, Cambridge University Press, Cambridge, 1990. Manpower, Talent Shortage Survey, 2012, http://www.manpowergroup.com/talent-shortage-explorer/#.WBcTivnhDIU, (30.10.2016). McLellan H., Situated Learning Perspectives, Englewood Cliffs NJ, Educational Technology Publications,1995. MIBACT, Piano Nazionale di Educazione al Patrimonio culturale, 2015. Neary S., Dodd V., Hooley T., Understanding Career Management Skills: Findings From the First Phase of the CMS Leader Project, International Centre for Guidance Studies, University of Derby, 2015. Regione Toscana, La programmazione educativa territoriale per l'anno scolastico 2014-2015. Savoie J. M., Hughes A. S., Problem-based learning as classroom solution, in “Educational Leadership”, 52(3), 1994, pp. 54–57. Schmidt H. G., Problem-based learning: rationale and description, in “Medical Education”, Volume 17 (1)1983, p. 11–16. Schön D., Il professionista riflessivo, Dedalo, Bari, 1993. Seale J., Gibson S., Haynes J. Potter J., Power and resistance: Reflections on the rhetoric and reality of using participatory methods to promote student voice and engagement in higher education, in “Journal of Further and Higher Education, 39(4), 2015, pp. 534–552. Semeraro R., L’analisi qualitativa dei dati di ricerca in educazione, in Giornale Italiano della Ricerca Educativa, IV(7), 2011, pp. 97-106. Subramaniam, N., Freudenberg, B., Preparing accounting students for success in the professional environment: Enhancing self-efficacy through a work integrated learning programme, in “Asia-Pacific journal of cooperative education”, 8(1) 2007, pp. 77-92. Sultana R.G., Learning career management skills in Europe: a critical review, in “Journal of Education and Work”, Vol. 25(2), 2012, pp. 225-248. Trinchero R., I metodi della ricerca educativa, Laterza, Roma-Bari, 2004. Trombetta C., Rosiello L., La ricerca azione, Trento, Erickson, 2000. UNESCO, World Heritage Education Programme, 1994, http://whc.unesco.org/en/wheducation/ (30.10.2016). Vygotskij, L. S., Il processo cognitivo, Torino, Boringhieri, 1980. Wertsch, J. V. (a cura di), Culture, communication and cognition: Vygotskian perspectives, Cambridge, Mass., 1985. Woods D. R., Problem-based Learning: How to Gain the Most from PBL, Waterdown, ON: Donald R. Woods, 1994. Zipsane, H., Instrumentalism in Heritage Learning, in “Museum International”, N.249–250 (Vol. 63, No. 1–2, 2011), UNESCO Publishing and Blackwell Publishing Ltd.
Zipsane, H. Lifelong learning through heritage and art. In: P. Jarvis (ed. ), The Routledge International Handbook of Lifelong Learning. Routledge, London and New York, 2008, pp. 173-182.